Description: Aventurine is the fiercest, bravest kind of dragon, and she's ready to prove it to her family by leaving the safety of their mountain cave and capturing the most dangerous prey of all: a human. But when the human she captures tricks her into drinking enchanted hot chocolate, she finds herself transformed into a puny human girl with tiny blunt teeth, no fire, and not one single claw. She's still the fiercest creature in these mountains though - and now she's found her true passion: chocolate! All she has to do is walk on two feet to the human city, find herself an apprenticeship (whatever that is) in a chocolate house (which sounds delicious), and she'll be conquering new territory in no time ...won't she? Wild and reckless young Aventurine will bring havoc to the human city - but what she doesn't expect is that she'll find real friendship there too, along with betrayal, deception, scrumptious chocolate and a startling new understanding of what it means to be a human (and a dragon). 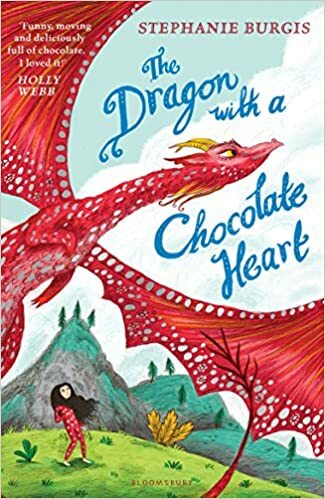 A pinch of Ella Enchanted, a sprinkling of How to Train your Dragon and a generous helping of Eva Ibbotsen -The Dragon with a Chocolate Heart is entirely delicious. My Thoughts: Aventurine is a young dragon; her scales aren't even hard yet. She is also impetuous, impulsive, and eager to prove herself to her elders. She hasn't yet found her passion but she thinks venturing out of her protected cave might lead her to it. Unfortunately the first person she runs across is making hot chocolate and happens to be a food mage. Rightly fearing that Aventurine intends to eat him after finishing the chocolate, he casts a spell that makes her a small twelve-year-old human. He suggests that she find her way to the nearest city to make her fortune. Aventurine finds the human city crowded and very, very confusing. Luckily, she is taken under the wing of Silke who helps her acclimate. After being thrown out of the two most popular chocolate houses in the city, she happens on the third just as the current apprentice is being tossed out the front door. Aventurine is given the job and realizes that she has found her passion. Unfortunately, the owners of the shop have been taken in dislike by the Lord Mayor who is doing all sorts of sneaky things to make the shop look bad. Things come to a head when the King, the Crown Princess, and Princess Sofia arrive incognito and the Lord Mayor's people pull a surprise inspection and spread rumors that the shop is failing health standards. It gets even worse when dragons begin coming near the town. The King and Lord Mayor fear that the city will soon be under attack. The mages want to test their mettle against the dragons. It takes some fast talking from Aventurine to save the city. I loved Aventurine both because she finds her passion and because she learns a lot about both humans and dragons in this story. I like the magic and I really like the chocolate. This is a very entertaining middle grade fantasy. "So?" Martina said. "What do you think?" She gave me a hard look. "Are you going to hide away forever, just to keep yourself safe from ever failing again? Or are you ready to throw out that batch of your life that went sour, mix yourself up a new one, and work to your last breath to make it the best you possibly can?" She crossed her strong arms. "In other words, apprentice...are you coming with me or not?" I received this one for review from Bloomsbury. You can buy your copy here.